If you haven’t heard of Ouya, they had a wildly successful Kickstarter campaign to make an Android-based open gaming platform. The idea was to be inexpensive and developer-friendly. The console itself was designed as basically an android phone with no screen, so it would be easy for developers of Android games to port games to Ouya. 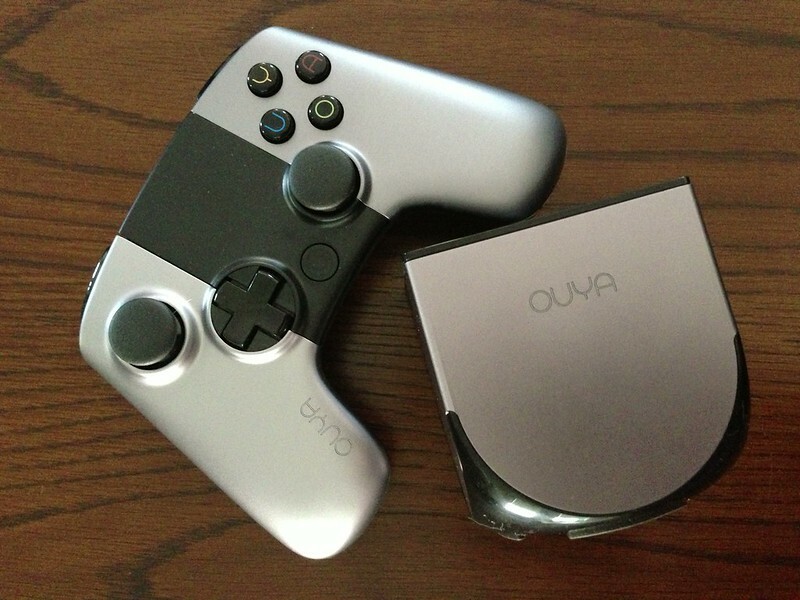 I backed the Kickstarter, and just got my Ouya this week. It doesn’t launch officially for another month or so. So, how is it? Well, it’s kind of mixed. Some of which may improve before the public launch, some of which may not. 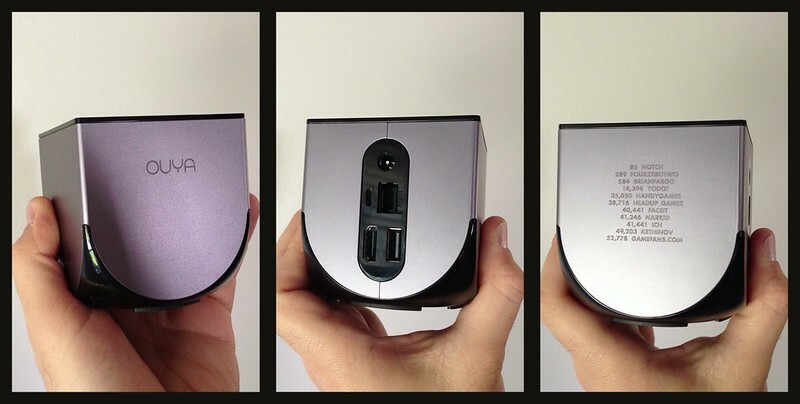 The Ouya console itself is nicely minimal. Just a small box with some ports on the back and a button on the top. There are also the names of the top Kickstarter supporters etched into the side, at the top of that list is a familiar name – Notch, creator of Minecraft. Setup is simple, just attach it to your TV with an HDMI cable, and plug the power in. Ethernet is optional, it has WiFi, though I opted to use ethernet. USB port is also optional, for external storage and other USB stuff. The small size of the box does mean it will be at the mercy of the cables plugged into it, if they aren’t completely slack they could tip the Ouya on its side. The controller looks nice, so much so that I ordered an extra one to use for a second player or to use as a controller for my laptop. However, looks are not everything. The controller is pretty big, somewhere between the Xbox 360 and Original Xbox controllers. It feels decent enough, and holding it my trigger fingers naturally rest on the L2 and R2 buttons, as with the Xbox 360. The problem is not the size, though it could probably stand to be a little smaller. The main issue with the controller are the battery placement and the responsiveness. 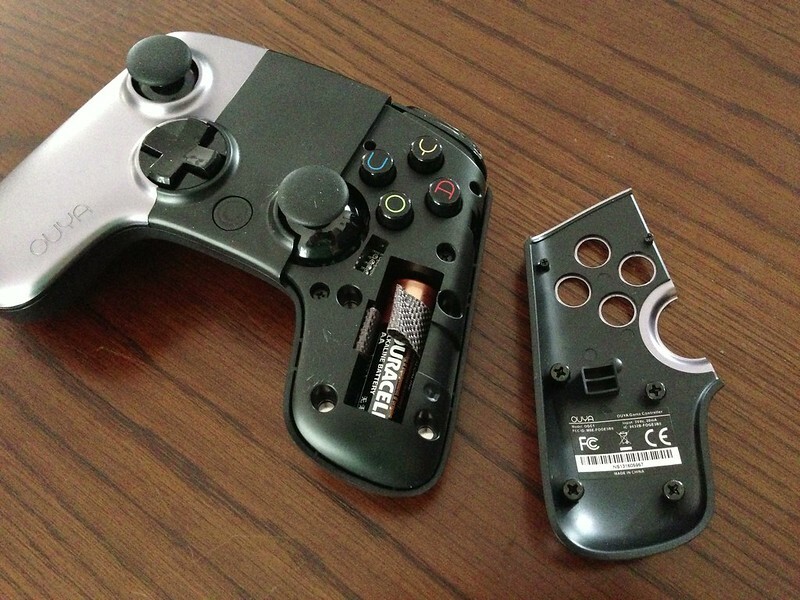 It takes 2 AA batteries, which are inside the handle parts of the controller. To get to them, the silver front plates on the controller lift off, allowing access to the batteries. It’s not a difficult process, although it’s not totally smooth, getting the plates off may take a little prying with fingernails. The faceplates are held on with magnets, which seems like a good idea, but seems to cause problems. The plates don’t sit completely snug, which doesn’t seem like a problem at first, but when I was playing a game and hitting the O button, it suddenly got caught under the faceplate, causing my character to die a horrible digital death. The other issue with the controller is lag. I was playing Pinball Arcade (which I have for iPad, so seemed like a good comparison) and the flippers would flip well after I pressed the trigger. It could be an issue with that particular game, it doesn’t allow you to remap the controls, so I was stuck using the L2 and R2 buttons, which are analog triggers, so perhaps they weren’t calibrated correctly in the game code. Whatever the reason, it made the game basically unplayable. Luckily, the Ouya and PS3 both use bluetooth, so I paired a PS3 controller to the Ouya and gave it a try. Suddenly Pinball Arcade was playable! 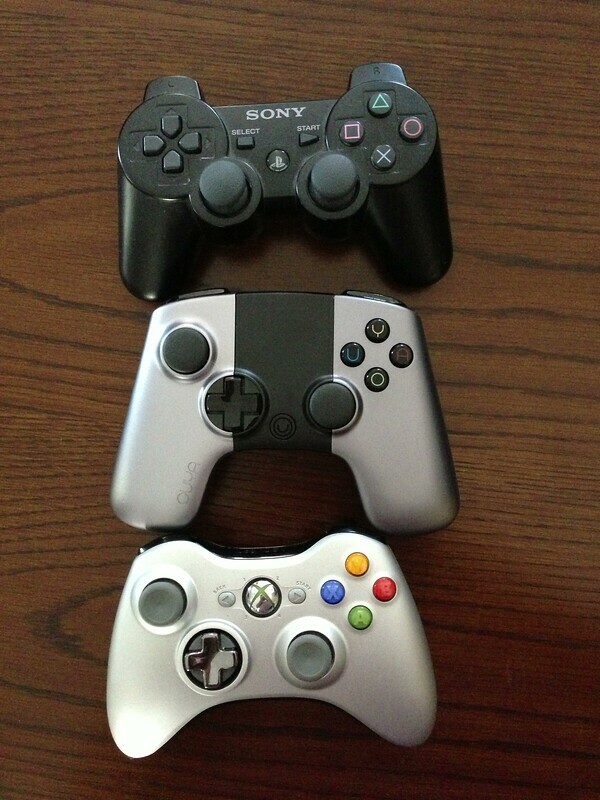 I played a few games with the PS3 controller and it seems to make the Ouya experience much better. However, some games didn’t recognize the PS3 controller’s input and would only work with the Ouya controller, so it’s unfortunately not a cure-all, which is really too bad, the PS3 controller was better in pretty much every way otherwise. The Ouya controller does have a touchpad-like surface in the upper part (probably part of why it’s so large) which can act as a mouse if you need that for something. The menu system on the Ouya isn’t bad, but it still feels beta-y. It is sometimes unresponsive, and game thumbnails can sometimes take forever to load, and don’t seem to cache very well, so frequently I find myself browsing lists of games that are just titles since the images haven’t loaded. Also navigating the menu is sometimes laggy, sometimes moving a direction seems to “stick” and move several times instead of once. This seemed to happen less when using a PS3 controller, so maybe it’s partially a symptom of the controller. The menu didn’t seem terribly well organized grouping games into large categories several of which were “featured”-type categories. The broad groupings works ok for now but I can see it getting cumbersome once more games are available. This is the important part, right? It’s still a bit slim and disorganized, and heavy on “indie” type games, which is fine but they often don’t show off the system very well, with simplistic graphics. There’s also an interesting business model – all games are required to be free, and can optionally have an “unlock” option for money. This results in many games with different approaches to paying – some let you play the first X levels for free, some have a timer that let you play the first X minutes for free, some have purchasable blocks of time rather than a straight unlock price, some have constant banners and messages perstering you to buy. I can see what they were going for, but I’d rather have a more consistant model or just pay outright and avoid the pestering. I haven’t played that many games yet, but did find a fun little one called Bomb Squad. Picture Bomberman, but without the maze, everyone just running around an arena lobbing bombs at each other, and different types of bombs if you get powerup crates. Simple, but fun. Also the aforementioned Pinball Arcade, which does have control issues with the Ouya controller and even some when using a PS3 controller (the “pull back plunger and release” part is wonky and bad) but gameplay-wise is good pinball fun. There are quite a few games slated to come out on Ouya, so the library should flesh out soon enough. Don’t expect AAA titles, but there should be a good supply of smaller titles coming. I wouldn’t call the Ouya a failure, but I wouldn’t call it a complete success, either. Many of the issues could be fixed with software updates prior to the full launch, or even a little bit after, but some of the issues with the controller seemed like hardware issues that are unlikely to be fixed by launch. And a flaky controller is a hell of an Achilles heel for a console to have. It’s too bad some games didn’t work with a PS3 controller, otherwise you could just use a PS3 controller and never use the Ouya one. I suppose it’s still possible for Ouya to do another revision on the controller to fix these issues, but hardware can be an expensive thing to do design revisions on when they’d already considered it “done”. Would I recommend it? Hmm, hard to say. Right now I’d say “wait and see”, and if the controller issues get resolved, it could be a nice fun little system. At only $100 it’s cheaper than pretty much anything else out there.